Drop forged high grade steel tarmac cutter. 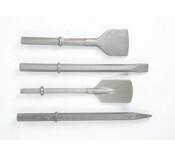 Wedge shaped cutter for use on coated stone. 32..
Drop forged high grade steel clay spade. For digging clay with no aggregate contamination. ..
Drop forged high grade steel moil point. For general breaking duties. 550mm Length x 32mm H..
Drop forged high grade steel narrow chisel. 32 x 160mm Hex. For controlled breaking along the ..